Interview Originally conducted June 11, 2009. 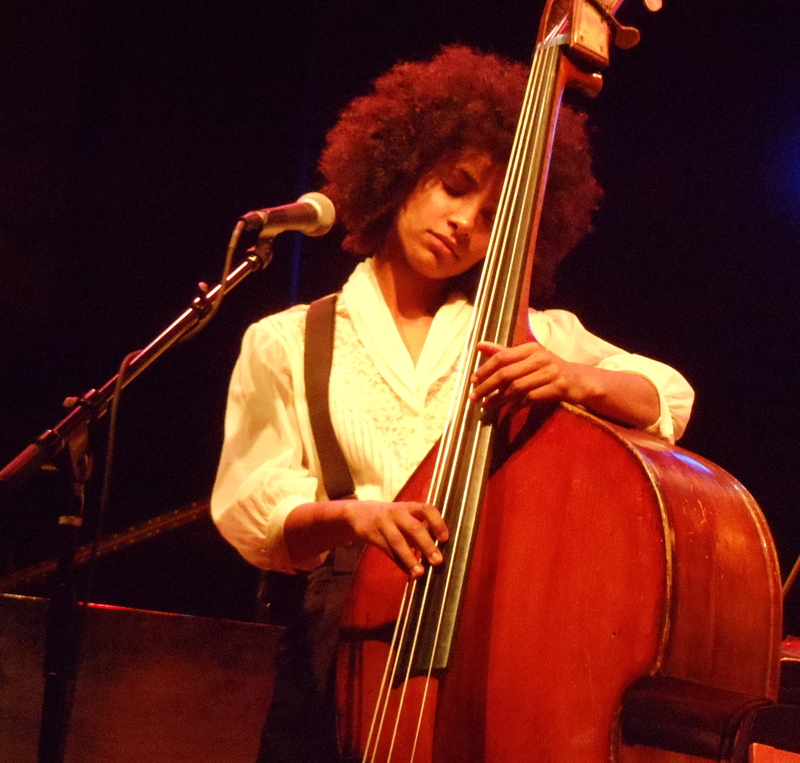 Esperanza Spalding is a rising star. Since this interview, originally aired on KFAI, she has released a new album, Chamber Music Society, returned to the Dakota to perform with the group on that record, performed at the White House, played with Prince at the BET awards, and has been nominated for a Grammy for the Best New Artist of 2010. Spalding is multi-lingual, brimming with energy, and seems to thoroughly absorb music in its many forms. The bassist/vocalist/composer/arranger was 25 at the time of this interview, shortly before her appearance at the Twin Cities Jazz Festival in Saint Paul. LE: You just returned from a tour of Brazil. ES: Yes, it was amazing. The first night we were co-headlining with George Benson, which was amazing just, you know, to be in the same room with him. Then the second night, when we went to Rio, I got to spend one evening with Ana Carolina, who is a phenomenal superstar there, and got to spend the rest of the night at Milton Nasciamento’s house, playing music, drinking wine, and being with him, so it was, to say the least, one of the best experiences of my life so far. So really, I love the country, not just for Milton Nasciamento, but I just love the country. LE: That sounds terrific. Now, you took up the bass when you were fifteen. You had already learned the guitar and violin, and did very well with that. What was it about the bass that appealed to you? ES: Well, I didn’t come to it from a distance. It was something that I literally stumbled upon, and it was interesting. I thought wow, what’s up with this sound, what do you do with this instrument? And my interest has kind of stayed piqued. It was really a casual introduction, you know? Once I started playing it, there’s something about the instrument, the way you could play it. Everything about it just intrigued me, and I never put it down. LE: Once you put it up and never put it down, it seems you were on this arc to become a professional musician. Was there a point at which you made a distinct decision to be a professional, or were you just enjoying music? ES: And obviously I took it seriously my whole life. But moving across the country to a totally different place. Okay, this really signified I’m committing to do this in a very serious way as an adult. That was probably the defining moment. LE: And that opened up some opportunities for you, in terms of the teachers that you met there, and you ended up touring with Patti Austen for a while. ES: Yeah, yeah. It was amazing. I met Joe there too, Joe Lovano. I met a lot of people there. For me, working wasn’t so much about the school. I didn’t really enjoy actually being a student there at all. But, I really enjoyed meeting the other musicians that were there, and so many phenomenal figures in the industry and musicians would come through, and you’d get a chance to get close to them and interact with them and to learn from them. To me that was what was phenomenal about it. You’d get sense of what it’s like to be a musician and to hear what it’s like to have that life and work. And the business. No matter what music you’re doing, you do have to have a sense of how the business aspect works too. That’s the kind of world that opened for me while being there. LE: Though you say you didn’t enjoy being a student there, you ended up teaching at Berklee for a while. ES: That’s right. (chuckles) That was a lot more fun. I enjoyed that a lot more. LE: Is there anything that you, as a musician, and as a bass player, strove to impart to your students? Something they wouldn’t get from anybody else, or about your philosophy, or how you work, that you thought it important for your students to learn? ES: Yeah, what I thought, and what I still try to instill in anybody that I talk to, and am working on cultivating more myself, is independence and self-responsibility in pursuing the knowledge, particularly in jazz. We’re surrounded by recordings and notations of what the masters before us have learned and cultivated. I always got the sense in school that they teach you to be like a helpless puppy, waiting to get information from somebody. All of us teachers don’t have much experience touring and being professional musicians anyway. And when you train students to depend on a teacher for information, when they get out of school that’s the same intel that they have and it can be really limiting. Especially people that have some essential talent – I want to instill in them the ability critique themselves, ask the right questions of their peers and other musicians they get to play with, so that when they get out of school they really can be self-sufficient individuals and artists that always know how to grow, and how to push themselves. Know where to look. Find the answers, find the right questions and know how to get information out of the library that we have surrounding us from recordings and videos and YouTube. The answers are all around us, so instilling in students how to find them on their own. LE: You’ve done some work with Stevie Wonder, you’ve just had Folk Art come out with Joe Lovano and UsFive. You’ve also worked with the young trumpeter Christian Scott on his album Anthem, providing deep deep bass on one song, “RE:.” And then you used his uncle, the New Orleans saxophonist Donald Harrison on your own album. How do you approach things when you’re in a collaborative effort, versus when you’re doing your own album? LE: You mention composing, and almost all the songs on your album on the Heads Up label (Esperanza) are your compositions. Do you have a set routine for composing? ES: A set routine, hmm. LE: Yeah, do you sit down at any particular time and say, I’m going to try to write something? How does that work for you? ES: I think if I was home more, than I would. Usually when I’m home, the first thing that I do if I have the morning free is go to the piano and just play. For me, I’m gone so much that any second I can get I’m going to use to try write something on the piano if I’m home, because most of the writing for me happens at the piano. Other than that, there’s no set routine, and for me, I never know where inspiration is going to strike. But I definitely try, even if I don’t have a specific idea, I definitely try to practice composition and writing, and completing tunes and making segments, and segues, and modulations. I try to practice all the tools that I would need, to finish a song when it does strike. LE: You really perked up when I mentioned the new Joe Lovano album. How did that come about? ES: Ooh, Amazing. It’s so different, incredible, creative. How’d it come about? I don’t know. It came about because Joe is so amazing and creative. He will hear a sound or a concept and envision something. Next thing you know, that’s what we’re doing. I’ve been playing with Joe for what, about five years now? Four or five years, I guess. Whoa, that’s weird. I didn’t realize that. (laughs) I never think about it. Umm, and we’ve played in various trios, quartets, and a quintet. And now he had this vision with the two drums, and we started playing some of the music in the last year. We did a week at the Vanguard and he finally decided it was time to record that particular group. It’s amazing. We just did a little tour in Europe. We did ten dates. Every time we play, you can watch people. They can’t believe what they’re hearing, their minds are totally blown. LE: It’s a great album. ES: It’s an exciting album Live, it’s totally exciting! I can recommend if you ever see that UsFive is coming through check it out. It’s something else. LE: I noticed that Otis Brown plays on both your album and UsFive. Did you also work with Francesco Mela on Junjo your first album? ES: Yeah, that’s funny. I realize you’re connecting all the dots for me. Yeah, Mela’s on the first record I did with Aruan Oriz. And I actually met Otis through playing with Joe. What happened is a drummer of mine got sick and so Otis started playing with us, and he knew the music and he was there when we made the record. LE: This will be your second time in the Twin Cities. You were here in March, I think. Unfortunately, I missed that but did catch you at the New Orleans Jazz Festival. Are you performing anything other than what’s on your album for this appearance? ES: (chuckles) Most of it is what’s on the record. A lot of it is that we do some different arrangements of it. A lot of the music is old, but we tend to cater to the room, cater to what we’re feeling that day in energy from the audience. If I have new music, I want to try it out. We’re always doing things… You never know what’s going to happen. I never really know what’s going to happen. LE: Do you have plans to get into the recording studio soon? ES: Yeah, definitely. I have a lot of new music. I have two streams of sound that are coming out here, so we’re going to see if we can get it all down. LE: When you say two streams of sound, do you mean two different kinds of music? LE: Can you expand on that, or do want to leave it at that? LE: I want to thank you so very much. We are all very excited here in the Twin Cities that you’re coming back and that you’re going to play at this little outdoor festival. It should be great fun. We’ll see you next Saturday. ES: Thank you, Thank you. Take Care. This entry was posted on Wednesday, December 29th, 2010 at 10:30 am and is filed under Interviews. You can follow any responses to this entry through the RSS 2.0 feed. You can leave a response, or trackback from your own site.